This is a classic, delicious Honjozo with crimini mushroom, almonds and lilac aromas. The first sip of this sake is full of stone fruit and minerals complimented by notes of caramel, cocoa and almond and finishes with plenty of umami. FOOD PAIRINGS: Chinese Food, One Pot dishes like Beef Stew. The toji, Fuse Tokutaro, is 76 years old and has been working at the brewery for 43 years. His family has held the toji position for several generations. Fuse Tokutaro is also the presdent of the Echigo Brewers Association, a very prestigious position. Water is key to the production of the sake, as it is not soft water here, nor is it hard water, it is inbetween. The minerals present in this vast water table underneath the brewery provides abundant quantities of water for production purposes. 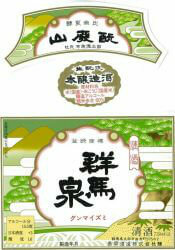 Gunma Izumi sake are typically blended with older sake, and /or aged 1-3 years. All are done in a Yamahai style.